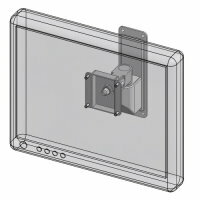 Compact wall mount LCD bracket(model #60216W series) - Sallas Industrial Co., Ltd.
Sallas - wall mount compact LCD arm allows flat panel monitors to be mounted with a minimum profile yet still offers side-to-side, up-and-down and pivot mobility. Patented counter force balanced design and adjustable friction design provide personalizing usage for a most smooth and effortless adjustment while maintaining screen stability-without the need for knobs or levers. Rugged frame support a flat panel monitor weight up to 11kgs (24 lbs). Side-to-side rotation: 180 degree (with adjustable rotation tightness). Counter force balanced monitor tilt: 45 degree up and 25 degree down. 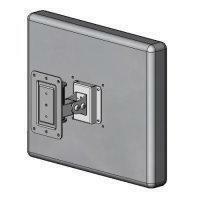 Durable wall mount bracket and aluminum alloy pole clamps available for 1 1/2" or 2" pole.